There is an inherent problem with putting everything in all caps and not having punctuation. I had to read this sign more than once to figure out what it really meant. I mean, if the "UNATTENDED PLAYGROUND CHILDREN" are "ACCOMPANIED BY PARENT" then they aren't really unattended are they? 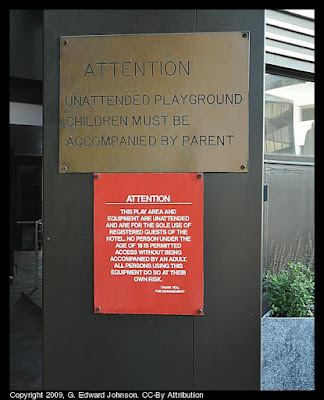 If, on the other hand, they had put a period after the word playground and done some decent capitalization, and maybe a bit better grammar then I would have read "Unattended Playground. Children must be accompanied by a parent." Much better isn't it. Now, moving on to the second sign, according to it, children only have to be accompanied by an adult, it doesn't have to be a parent. Of course anyone over 18 is free to play on it without a child (which is refreshing, I've seen more and more places requiring you bring a child to kid-focused activities.) Still ALL CAPS but at least it has punctuation. But still, something isn't quite right. Hmm, let me think. Oh yes. There isn't a playground anywhere around this sign. 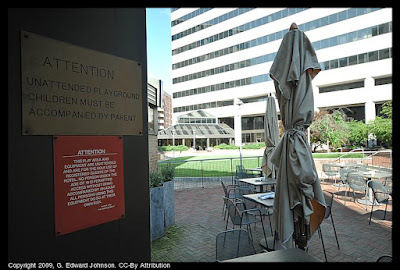 I assume at some point in the past there was, but now it is the patio seating for the Daily Grill at the Bethesda Hyatt. At least they did a good job attaching the sign. In case it is hard to read the second sign, it says "Attention. This play area and equipment are unattended and are for the sole use of registered guests of the hotel. No person under the age of 18 is permitted access without being accompanied by an adult. All persons using this equipment do so at their own risk. Thank you, The management."